Time to try a new macaron flavour. There’s one that has been lingering at the back of my mind, and I’ve not had the opportunity to make it. 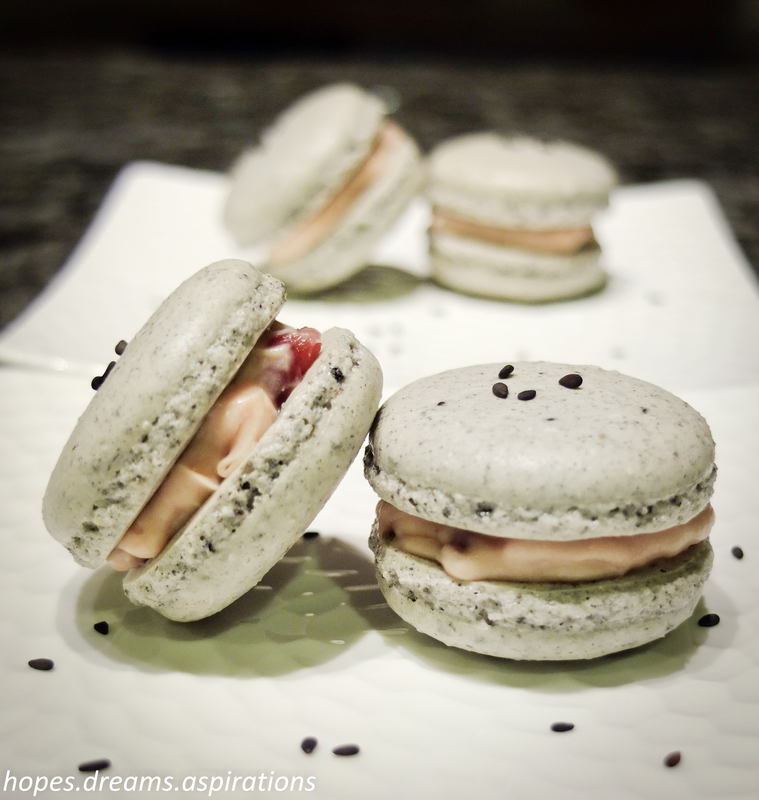 With Mother’s day coming around this Sunday, I think it is perfectly timed for me to make a black sesame macaron paired with a mascarpone and red bean filling. This is for my mum who cannot resist anything red bean. I love you mum! (these won’t survive the postal service so you will just have to wait till our trip home later!) Happy Mother’s Day! Roast black sesame seeds in a heavy-base pan over a low-medium heat until they are aromatic. They will start to pop. Shake the pan regularly to ensure the seeds don’t get burnt. Grind roasted sesame seeds in a powerful nut processor until they are finely grounded. I dug out my magic bullet and gave it 15 seconds of blitzing and there I have a bowl of black sesame seed meal. It was so easy I couldn’t believe I didn’t think of it before. Clip the sugar thermometer according to manufacturer’s instructions to a milk saucepan, put the water and caster sugar in and dissolve the sugar over a low heat. Some recipes say you should stir this gently – I’ve found that so long as I didn’t splash the sugar around, I won’t even have to stir. 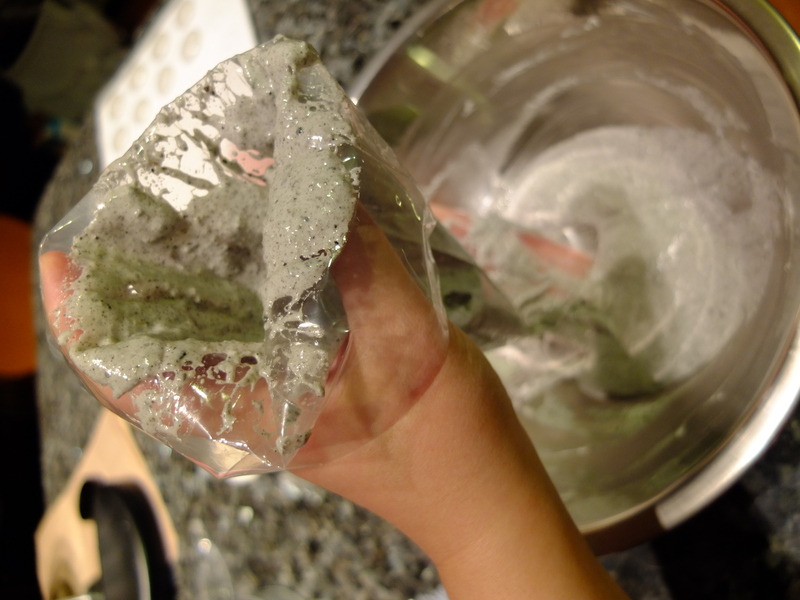 Use a clean pastry brush to brush down the side of the saucepan to avoid any crystallization if the liquid splashes up. Increase the heat. 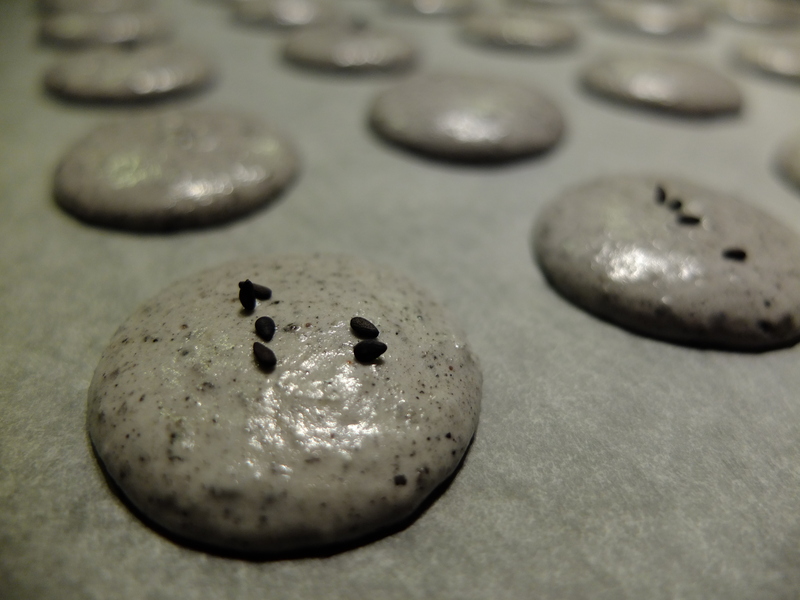 To make blackish-coloured shells, I added the colouring paste to my Italian meringue. The amount depends on the strength of your gel, what depth of colour you desire and how it mixes with other ingredients. Practice is the only way to test it out. I scrapped tiny balls out using a tooth pick. Add the extra egg white to the almond meal mix, then add the meringue and use a large spatula to thoroughly combine it. Continue mixing the mixture to soften the meringue. Don’t be afraid to slap the mixture down.To achieve “macaronnage”, I mixed the batter about 18 times. Don’t over do this. Today I waited for 30 minutes for a skin to be formed. I also decorated the tops with a few roasted whole black sesames. I fan-baked them at 125°C, for 16 minutes. After a few minutes in the oven, I could see them rising nicely. I paired these with a mascarpone cheese and red bean filling. Mix the mascarpone cheese and azuki bean paste together. Chill while your shells are baking. 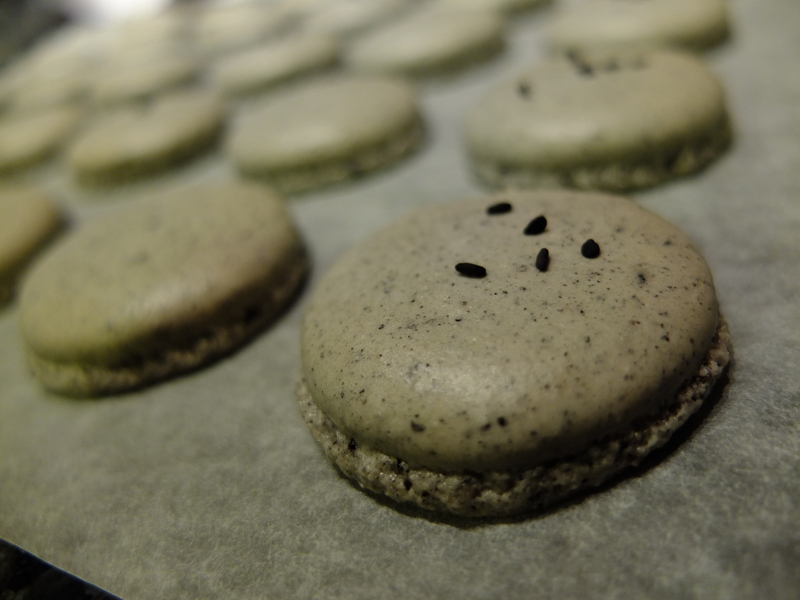 When the shells are cooled, spread the filling onto the macaron shells. These need to be kept in the fridge for 24 hours for the ganache to flavour the shells, so don’t eat it yet! I have not tried freezing these so cannot comment on that. However I’m sure my friends will gladly polish these off for me so that they won’t have a chance to go near the freezer! Loving this combination! I’ve been searching the shopping isles for the meringue powder but have not been able to get my hands on it. Will the recipe still work if I do not add this ingredient? Appreciate your help and tips! Hi and thanks for stopping by! 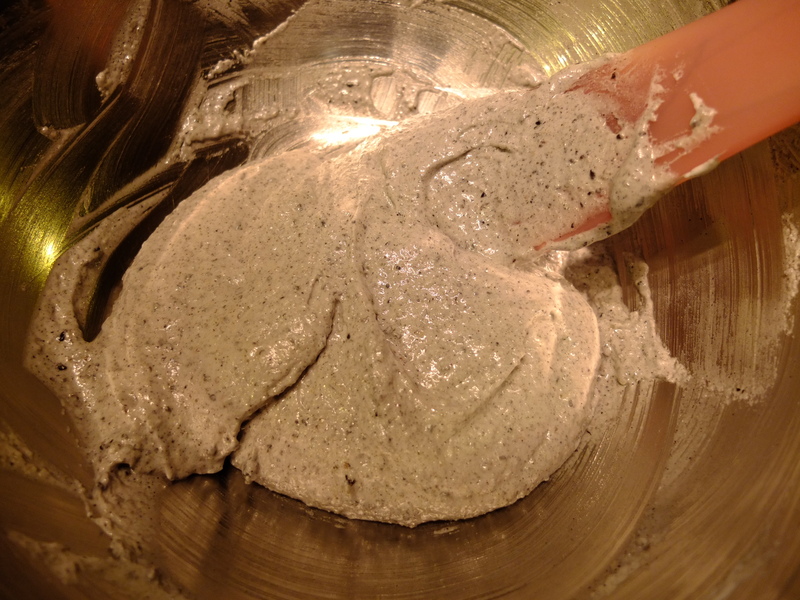 The meringue powder does help add body to the mixture and I havent tried without it. I have always had it since I use it for making buttercream. Mine is a Wilton product too but other brands make it too. Some say it can be replaced by cream of tartar. Which country are you in?